I can’t remember a time when sewing and art haven’t been a part of my life. My mother taught me how to sew at an early age. I started and never stopped. By high school, I was making my own clothes. And then came the cards. I like to give everything a personal touch so I abandoned the card aisle at the store and started making my own. Family and friends’ birthdays were celebrated with my handmade cards. “An A in art class doesn’t make you an artist,” warned my high school counselor. In 1988 I set out to prove him wrong and started a greeting card company, My Dream Designs. This allowed me to share my love of art and design … to share a little piece of me. 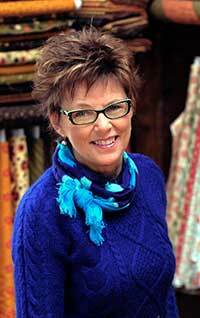 In 1992 I combined my love for art with my passion for sewing into the quilt pattern company, Pieces From My Heart. My patterns were a hit! At my very first international Quilt Market -– St. Louis in 1994 -– I was discovered by Moda Fabrics. Over fifteen years, and countless fabric lines later, I’m thrilled to still design for Moda. They give me unlimited freedom to design from my heart. I like to say that I don’t have a signature “look” –- many of my patterns are wildly different. What I do have is a signature style. I like people to look at my designs and see a little piece of me; I like them to recognize a bit of Sandy in everything I do. I love what I do and I want to convey that to my customers. Those handmade cards thirty years ago? One of them made its way into the hands of Bruce, the man who would one day be my husband. We reside in Algona, Iowa. We have two grown children, Anthony and Abby. My patterns are available at your local quilt shop, or here at www.piecesfrommyheart.net for more information.